Pedro was born in Lisbon but now made his way much further away. He’s an amazing person, can fluently speak 6 languages (or 7… we do not remember ;)!) and is an extremely inspiring person. 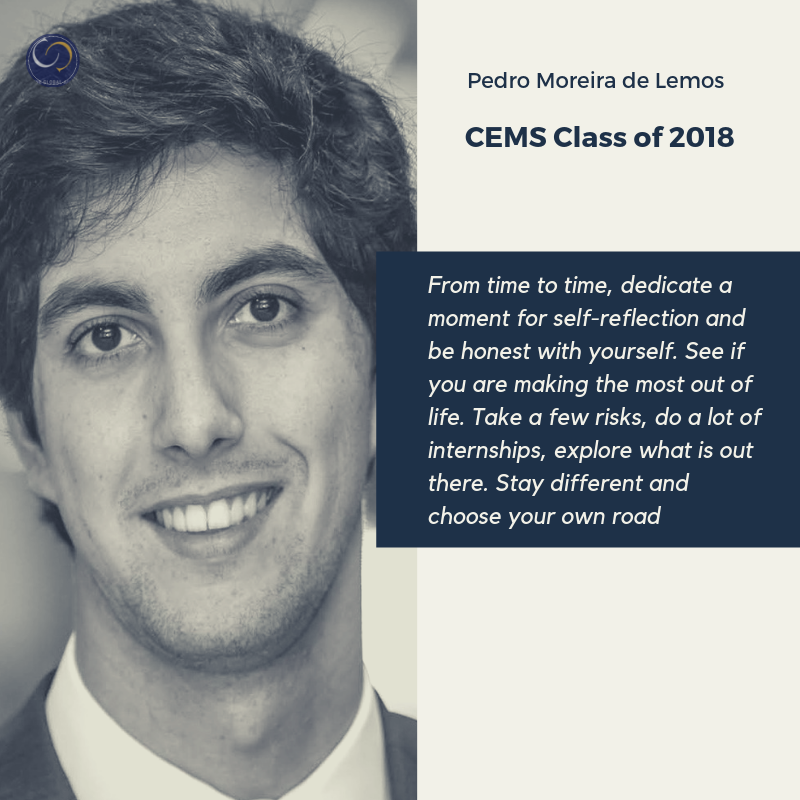 If you would have to describe CEMS in one sentence, what would it be? What was your best experience at NOVA? The Nova way of life is made of extremes (and I believe that everyone at Nova can relate to that). 5 years of Nova gave me tremendous joyful moments while simultaneously contributing to strengthen my anxiety. However, stimulating curiosity, incentivizing participation in extra-university initiatives and clubs and instigating a great environment where you can meet and collaborate with incredible individuals that I now have the privilege to consider as friends are traits of an outstanding university. The aggregation of those and many more constitute my very positive experience at Nova. And yes, I would do it all over again. What would you recommend every CEMSie? I am not exactly the type of person that quotes verses and authors to give life advices, yet Robert Frost was onto something when he claimed: "Two roads diverged in a wood, and I—I took the one less travelled by, and that has made all the difference". Don't choose your career or don't live your life according to what you think others may perceive as being cool or as being an incredible achievement (or as we may call it alternatively, instagrammable life decisions). From time to time, dedicate a moment for self-reflection and be honest with yourself. See if you are making the most out of life. Take a few risks, do a lot of internships, explore what is out there. Stay different and choose your own road. Difficult to say at this stage in life as we cannot all be Malala Yousafzai and have astounding achievements at this age. However, I believe that numerous sets of small achievements leading towards a happy and balanced life, between a job where you feel that you are listened to and can truly contribute, along with a "besides-work" life in an exciting, futuristic and dynamic city as Dubai may seem like a solid personal achievement. Sometimes it is better to have small victories spread throughout time than just one big concentrated one. It may sound like a boring answer, but never take a balanced and happy life for granted, especially at the beginning of your career.